Chandan Lodha is co-founder at CoinTracker, a Y Combinator and Initialized Capital-backed startup that offers a secure cryptocurrency tax calculator. He was previously the Product Manager on Project Loon at Google[x]. Fred traded bitcoin, ether and a handful of other cryptocurrencies on Gemini, Binance and Coinbase last year. Unfortunately, due to the crypto downturn, his trading yielded a capital loss of more than $35,000. He’s not alone — the stories have been coming out right and left about people who are not already rich, who have lost serious money lately. While it was a rough loss, filing taxes could add another headache in a few weeks if not done correctly. Given that bitcoin is down 55 percent year-over-year in 2018, compared to 686 percent up the year before, chances are that filing taxes on crypto trades may look quite different this year for crypto holders like Fred. To get an understanding of how powerful this is, let’s take an example. Imagine Maya earned $5,000 in the stock market in 2018, but lost $9,000 in cryptocurrency trading in the same year. Without filing cryptocurrency taxes, Maya would be on the hook for capital gains taxes on $5,000 from the stock market. At the 24 percent short-term tax rate, that would be $1,200 ($5,000 * 24 percent) to pay in taxes! Now, taking into account the $9,000 crypto capital loss, all $5,000 of capital gains in the stock market would be offset, leaving an additional $4,000 of losses. Because Maya is single, an additional $3,000 of income could be offset (which normally would also be taxed at 24 percent). Therefore, you would save $1,200 of taxes (from the stock market) and $720 ($3,000 * 24 percent) that would have been paid in income tax, for a total of $1,920 saved in taxes. And, on top of that, Maya would still have an incremental $1,000 ($9,000 – $5,000 – $3,000) of capital losses that could be rolled forward to the 2019 tax year to offset capital gains (and potentially income) the next year as well. Not bad. The last year brought many new cryptocurrency trading pairs versus earlier years, as well as more transactions on more exchanges. This means, more than ever, you’ll want to ensure that you have all your accounts or records from all the accounts handy. There are also regulatory differences as well. This year for U.S. holders, the IRS has clarified that like-kind exchanges only apply to real property (like real estate). That means that cryptocurrency-to-cryptocurrency trades in 2018 are subject to capital gains calculations, not just when you cash out to fiat currency (e.g. USD) at the end of the day. According to IRS guidance, all virtual currencies are taxed as property, whether you hold bitcoin, ether or any other cryptocurrency. With the new clarification that like-kind exchange does not apply to cryptocurrency, this means you need to have solid records of every cryptocurrency transaction you made, including crypto-to-crypto transactions. 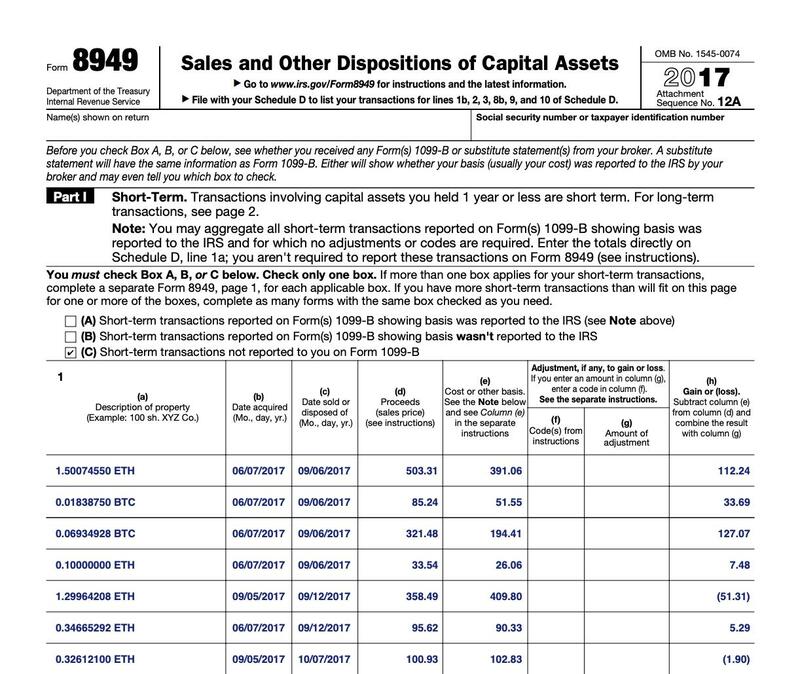 Keeping track of all of these individual transactions can turn into a nightmare scenario depending on your trade history; however, it is important to have a record of all your transactions so you can file your IRS Form 8949, the capital gains tax form. New tools are also starting to be built to help automate the tracking, record-keeping and tax form generation for your cryptocurrency taxes. My company, CoinTracker, is one — and Fred is a real client. He’s preparing his taxes now: he will be able to wipe all his capital gains clear for 2018, offset $3,000 of income, and also rollover all the rest of the capital gains to future years. While he doesn’t know the full amount in savings yet because he hasn’t finished his taxes, it will likely end up being thousands of dollars. In the event that you are a cryptocurrency miner, the IRS counts mined cryptocurrency as taxable income. The mined coins are included in gross income and taxed based on the fair market value of the coins at the time they are received. The filing method will depend on whether you are a hobbyist or business miner, which depends on factors such as the manner of the mining, the expertise of the taxpayer and the amount of profits. Hobbyists will add the income to their Form 1040 and not be subject to self-employment taxes, though not have as many deductions available. Business miners will include their income and expenses on Schedule C and their income will be subject to 15.3 percent self-employment tax (though will be able to claim deductions against income). Disclaimer: This post is for informational purposes only. For tax advice, please consult a tax professional.